Telangana Open School Society, TOSS Inter Exams time table April and May 2019 is released. It officially released the exam schedule on its official website telanganaopenschool.org. Students registered under Telangana Open Board can download the exam dates from the official website.The complete time table is also provided on the link below. The examination will commence from April 24, 2019 and conclude on May 6, 2019. The practical exams will be conducted along with these from May 10 to 14, 2019. The examination timing will be from 08:30 am to 11:30 am. Last year the exams started from April 17, 2018 and lasted till May 01, 2018. Step 2: Click on the link ‘TOSS-SSC &Intermediate (TOSS) Public Examinations April/May, 2019’on the homepage. TOSS Inter or Class 12th examination is held twice in a year. They are held in the month of April and October. The first examination will be held for Telugu, Urdu, Hindi, and Arabic. TOSS SSC, Inter exams 2019 Dates: Telangana open school exams released. The Telangana Open School Society (TOSS) has announced the examination dates for the TOSS SSC & Intermediate Public Examinations 2019. According to the TOSS, the examination for the SSC & Intermediate open candidates will begin on April 24, 2019. The TOSS SSC & Intermediate Public Examinations 2019 will be concluded on April 24, 2019. The TOSS SSC & Intermediate Public Exams will be held in morning session - i.e. 8.30 AM to 11.30 AM. Only those candidates who have paid the public examination fee for the ensuing SSC & Intermediate Public Examination April, 2019, will be allowed to appear in the examination. The candidates who are going to appear for the TOSS SSC & Intermediate Public Exams are advised to check the official website - http://telanganaopenschool.org - for more details visit the Official website. TOSS aims to provide access to sustainable learner-centric quality school education, upgradation of skills and training to learners through the use of innovative technologies and methodologies of Open and Distance learning (ODL). It provides the opportunity of continuing education to those students who have missed opportunities to complete school and development education. TOSS adopted the study material and syllabus of the National Institute of Open Schooling. It introduced the Intermediate (TOSS) course through ODL mode in the academic year 2010-2011. It identifies the educational needs of the people of Telangana who are not served by the formal school education system. It provides opportunities for school education upto the pre-degree level and promotes standards of ODL. It serves as an agency for effective dissemination of information related to ODL. Its objective is to design and develop courses, self-instructional materials and other learning support for the courses that are identified at different points of time. It aims to maintain the standards with the formal education system along with ensuring flexible characteristics of ODL. TOSS SSC, Inter exams 2018 Dates: Telangana open school exams released. 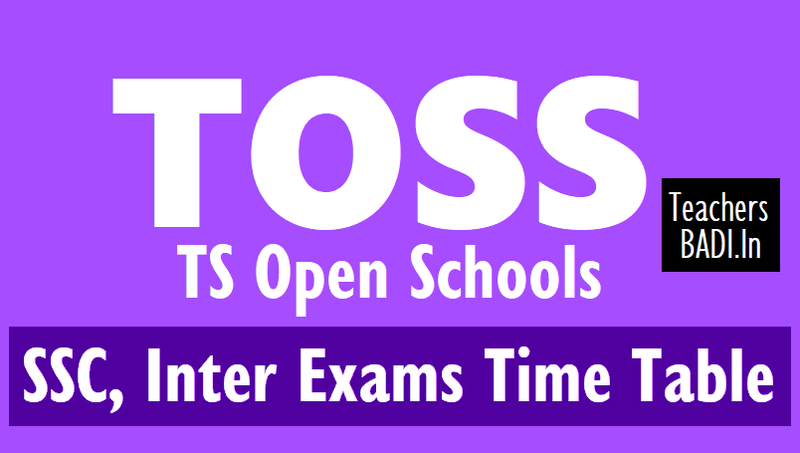 The Telangana Open School Society (TOSS) has announced the examination dates for the TOSS SSC & Intermediate Public Examinations 2019. According to the TOSS, the examination for the SSC & Intermediate open candidates will begin on October 24, 2018. The TOSS SSC & Intermediate Public Examinations 2019 will be concluded on November 10, 2018. The TOSS SSC & Intermediate Public Exams will be held in morning session - i.e. 9.20 AM to 12.30 PM. Only those candidates who have paid the public examination fee for the ensuing SSC & Intermediate Public Examination October /November, 2018, will be allowed to appear in the examination. The candidates who are going to appear for the TOSS SSC & Intermediate Public Exams are advised to check the official website - http://telanganaopenschool.org - for more details visit the Official website. TOSS SSC and Intermediate Public exams to begin on October 24. TOSS Exams 2019: Telangana Open School Society, TOSS has announced the date sheet for SSC & Intermediate Public Examination 2018. The exams would be held from October 24 to November 10, 2018 in the morning shift at 9:30 am to 12:30 pm. Students appearing for TOSS SSC examination 2018 may check the official notification on Telangana Open school society website, telnaganaopenschool.org. Check TOSS SSC examination 2018 complete schedule heare. Students who have paid the examination fee of TOSS SSC October/ november 2018 are eligible to appear for the exam. Direct link to check TOSS SSC Time table 2018. The first exam would be of different languages- Telugu, Oriya, Tamil, Marathi and kannada. No holidays are provided for any exam. Hhi sir!. i passed open inter 1st year in 2016.When is open inter 2nd year admissions dates. Plz help me out i this . Lost my hallticket number.is there any way to check out my result.